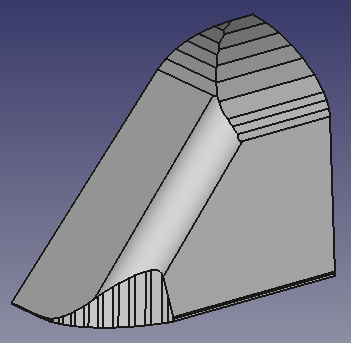 The cabin basic design, still needs to be rounded on the spiky side edge and smoothed on the top, before proceeding to the fine filing. 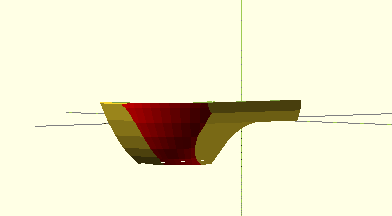 It is easier to re-build the shape of only the upper part of the cabin inside FreeCAD: with just one simple “fillet” action on the side edge, the basic rounded shape is there. Smoothing the ridge on the top is a little bit more tricky: applying a fillet to any short edge doesn’t work well, as the segments composing the ridge are oriented in different angles. 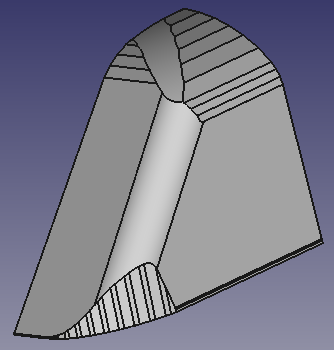 Then the solution is to cut away the spiky part of the ridge, leaving a smoother surface instead. 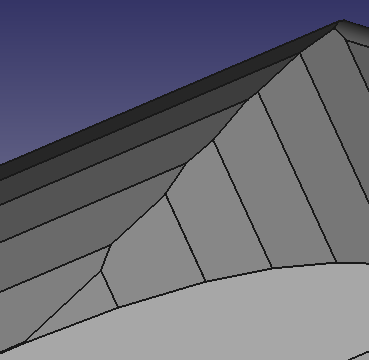 I created a profile which was cutting out the ridge, but at the same time including the whole upper cabin. The solid generated revolving it around the longitudinal axis includes the cabin, cutting out just the thin part of the ridge to be removed. 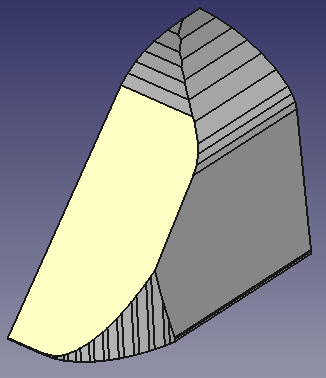 The boolean difference of the two shapes does the rest of the job: the result is the original cabin, with a smooth surface instead of the ridge. 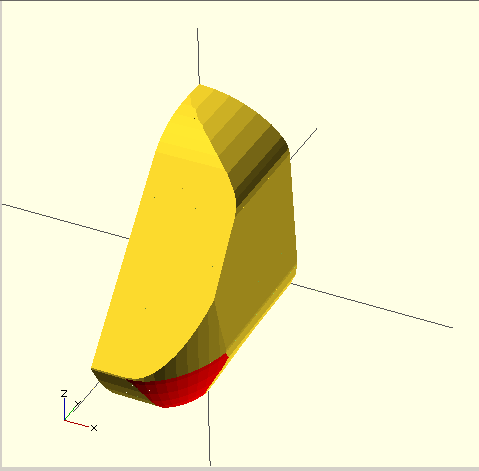 This shape is now ready to have the windows cut out, before being exported in stl format to be finely adjusted inside Blender. 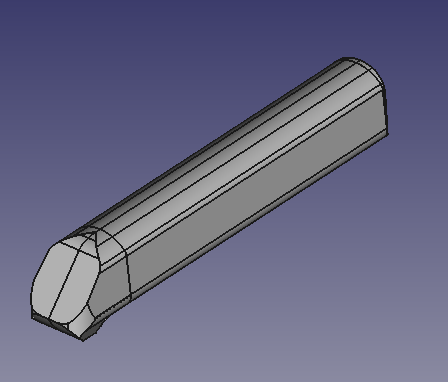 To be ready for the window cuts, the cabin needs too be hollow: I designed the profiles for the internal cavity of the cabin, extruded and intersected them to have a solid to be used to cut out the internal room of the cabin. Then I drew the shapes for all the windows, I created an extrusion solid from them, positioned it close to the part to be pierced and cut it out from the main solid (e.g. from the half cabin). I created in a similar way the frames internal to the openings and fused them together with the newly created pierced solid. 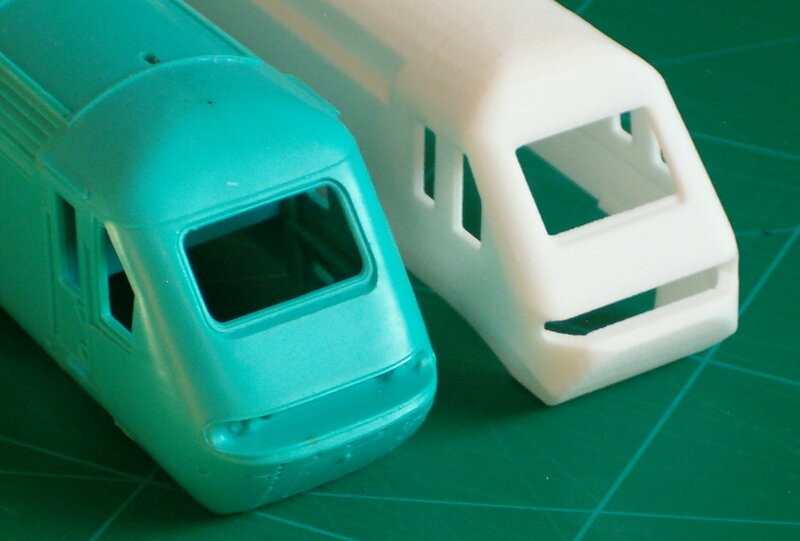 This technique worked quite straightforward for all the windows on the cabin, the body and the back. Then I faced the openings of the body for the grids on the side and on the roof. While the cut was as easy as for the windows, in these cases instead of the frames I added the internal bars supporting the side grids (as in the real case) and created an “L” shape behind the roof grid cuts to allow the final user (the modeler) to position and glue there the metal thin film structure representing the grid. When uploading this prototype on the webpage of the 3D printing company, the support bars behind the side grids openings didn’t pass the wall thickness checks for the white strong & flexible plastic. Then I added a panel just behind them to make the printout possible. I’m waiting for the sample to be shipped at my own home, probably next week 😀 . After designing the model of the back of the locomotive, starting as always from the blueprint and tracing the three orthogonal profiles, the main basic components of the Class 43 are ready: positioning them one adjacent to the other, the basic model of the IC 125 is ready for the fine chamfering and to be added all the details.